Another fine mess for breakfast. But I know WHY they were invented – because some cook got tired of trying to make perfect fried eggs! She decided, “To hell with this,” stirred the eggs, served them up, and dared anyone to complain (I’m betting that no one did). What does this have to do with Summer’s Secret Seasoning? Well, scrambled eggs are really good with a little of my seasoning sprinkled on top. 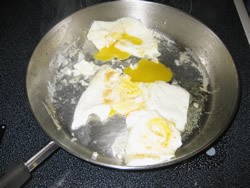 So I thought that fried eggs over easy – my husband’s favorite – would be good that way, too. I used to be able to fry eggs – honest! I even taught some cruising sailors my favorite, easy method … hot butter in the pan, pour in eggs, splash in a little cold water and cover with a tight lid. The top of the eggs steam to a pretty pink, with no flipping involved, and the combo of butter and a little water keeps them from sticking. Apparently, I have lost my touch. Lately, I have been unable to turn out perfect fried eggs no matter what method I use. I’ve tried a smaller pan, butter, olive oil, an olive oil/butter combo, a bigger pan, and even flipping them using just the pan, à la Julia Child (don’t ask). I played with heat settings: start with high heat, then reduce; start with high heat and keep high; start low and go high – No luck. I finally resorted to my old standby method – steaming – using my favorite old pan … See the top photo for the results. 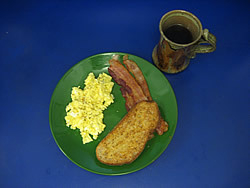 A perfect late Saturday morning breakfast: Puerto Rican coffee, crisp bacon, a toasted slice of my husband's homemade bread ... and scrambled eggs. So I have given up, at least for now. I need to move forward, developing and posting my other (successful) recipes using Summer’s Secret Seasoning. If anyone can suggest a way to create perfect over-easy eggs – one that does not involve using a non-stick pan – I’d love to hear about it. If it works for me, I’ll send you a free sample of Summer’s Secret Seasoning. ← I cooked all day … That’s why there’s no dinner.